On someone’s drawing board, The Watch probably sounded like a good bet. Why not put three proven veterans — Ben Stiller, Vince Vaughn and Jonah Hill — into a comedy slated for release at a time when audiences need a break from the explosive pleasures of summer blockbusters? 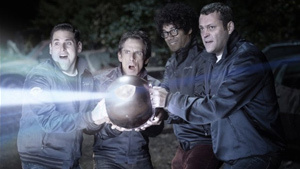 And how about adding British comic Richard Ayoade for a bit of off-kilter seasoning? The movie’s premise, by the way, sounds tempting, too — at least in a high-concept sort of way. A group of mostly inept guys from a small Ohio town form a neighborhood watch patrol, only instead of fighting would-be felons, they wind up battling aliens. A few minutes into The Watch, you may realize that what might have seemed fool-proof has dwindled into pure foolishness. The Watch is an overly vulgar comedy that manages to find a few chuckles amid a ton of distasteful material. Maybe this comedy was jinxed form the start. Originally titled Neighborhood Watch, the movie underwent a name change after the Trayvon Martin shooting in Florida. The title change may have avoided a few unpleasant associations, but it did nothing to make the movie any funnier. Stiller, who’s looking a little long in the tooth for these sorts of boyish antics, plays Evan, a manager at a Costco store. Evan lives with his wife (Rosemarie DeWitt) in a nice home in what appears to be an ordinary American town. An organizer by nature, Evan always seems to be starting clubs or making efforts to diversify his portfolio of friends. He’s reasonably happy until a Costco security guard — on the day he acquires U.S. citizenship — becomes the victim of a mysterious murder. Hoping to catch the guard’s killer, Evan forms a neighborhood crime-fighting unit. The only people Evan attracts to his misbegotten group are Hill’s Franklin, a wannabe cop who flunked the police exam and who lives with his mother; Vaughn’s Bob, a party-hearty guy who’s mostly concerned about controlling his teen-age daughter’s libido; and Ayoade’s Jamarcus, a British transplant who wants to meet women. The movie’s quartet of aspiring crime-stoppers quickly discovers that it’s chasing aliens instead of humans, but director Akiva Schaffer shows little facility for blending sci-fi and humor, a failing that’s especially apparent during The Watch’s overblown finale. And if you’re expecting a comment or two on the perils of vigilantism, you’ll have to look elsewhere. The supporting cast doesn’t bring much to the party, either. Billy Crudup shows up as one of Evan’s weirder neighbors. R. Lee Ermy portrays as a profanely irascible town resident, and Will Forte signs on as a local cop who has no use for neighborhood watches. Eventually, we learn that Hill’s Franklin keeps a small arsenal of firearms in his bedroom. When he shows his pals his collection of weapons, we’re supposed to laugh. Maybe it’s just me, but after the Aurora shootings, I had trouble thinking of a worse idea than turning a gun cache into a sight gag. Look, after the week we’ve had in Colorado, I couldn’t have been more primed for a ridiculous comedy: The Watch gets it half right. It’s ridiculous, but it’s not much of a comedy. One more thing: The Watch provides Costco with plenty of exposure: I wonder whether the company will be happy with the R-rated and mostly unfunny result.